Amanda was born and raised in north-central Indiana but has called Kentucky home since 1997. 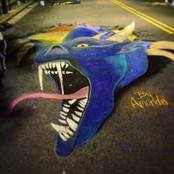 Chalking became a passion when she was invited to an event outside of Atlanta, Georgia early last year. At the 2016 Chalktoberfest, Amanda spread her wings and re-created a DaVinci drawing of a dragon attacking a lion. Since then, dragons have been Amanda’s subject matter of choice. Being relatively new to the street chalk world, Amanda has traveled to Colorado, Wisconsin, Tennessee and Florida (twice)…..and now Merietta…..so far this year. With 4 events still to go, 2017 promises to be a very enjoyable chalking year! At home, Amanda is a Dangerous Goods Specialist and enjoys kickboxing, reading, writing a blog for Via Colori, and, of course, art things. If money were no object, sculpting would be her true passion.